Via Ferrata Mürren is technically easy. It has some exposed passages and views of some of the most impressive mountain scenery in the swiss alps. The via Ferrata Murren is 2.2 kilometers long. The highlight is definitely the thrill of traversing a sheer cliff, the 80 meter long Nepal bridge and the awesome scenery. Full instructions, including the use of safety belays and via ferrata equipment will be provided. You must enjoy the great outdoors. 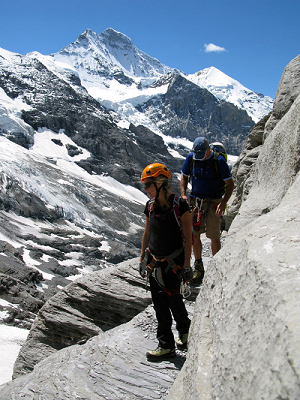 This Via Ferrata is set smack in the middle of the scenic swissalps. During this adventure you will be escorted to the summit by the most magnificent alpine scenery in rock, snow and glacier ice. Includes Via Ferrata set, boots, helmet, backpack, climbing harness, mountain guide and technical equipment. Kanderstegg via Ferrata offers some very challenging vertical stuff. An overhanging roof, a number of 30 meter rope bridges, flying foxes, and lots of exposed passages with steep ladders have been set up to keep your adrenalin going..
Free transfers Free pick you - Hotel Information please or from Interlaken Ost railway station. Via Ferrata "Eiger North Face"
Via Ferrata is set at the foot of the Eigersnorth face. At this altitude, you will be rewarded with the most spectacular scenery in the region. Free transfers We will pick you up free of charge from your hotel/hostel in the Interlaken area, or from Interlaken Ost railway station.